How do I purchase Favor Points? Can I use and iTunes gift card with Underworld Empire? Where can I see my Favor Points? What does this error message mean when I try to purchase Favor Points? I have just purchased Favor Points but they never came through. What do I do now? I do not want favor points credited to my account, I would like a full monetary refund. How do I do this? What should I know when contacting Underworld Empire Support for a billing issue? Did not get Promotion? Not seeing promotion? I crashed while using a scratcher, where is my reward? Where are my scratchers? I can not see them in my profile. Why hasn’t my Underboss Seat unlocked? Why can I not see a Diamond in the tech lab? Why are my lieutenants not showing in the combine list? My class is not gaining experience points. What is going on? Why am I being hit by a higher level player? Why can I not beat this player? This player is harassing me. What can I do? How do I get more Class Coins? I did X amount of damage to a boss and didn’t get what I expected? My game is crashing, what can I do? I jailbroke my device, can you still help me? I can not see images. How can I fix this? Last edited by UWE_Tank; 09-08-2014, 10:24 PM. Favor Points, also known as FP, are virtual points that can be used in game. FP is the best way to enhance your Underworld Empire gameplay experience. There are many different items that can be purchased with FP in the Black Market, all of which can provide special bonuses and exclusive benefits to your character. This includes being able to refill stamina and energy without waiting. 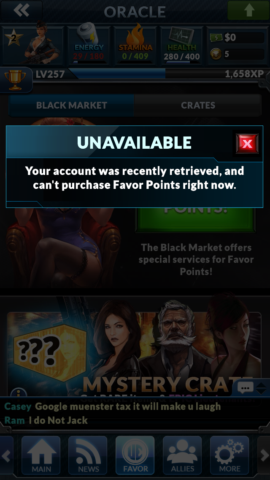 Favor Points are purchased in the App itself in the Black Market. You can find the Black Market by accessing the UE favor box on the bottom of your screen. From the Black Market, you can purchase different Favor Point packages by clicking “Get Favor”. The only payment methods we currently support is through Apple iTunes OR through Google Play. Can I use an iTunes gift card with Underworld Empire? 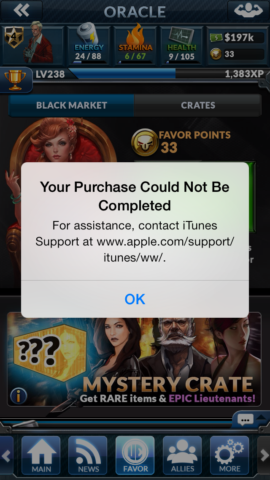 Yes, you can use an iTunes gift card for in app purchases. As long as you have redeemed your Gift Card on iTunes or the App Store, and it shows your account as being in balance on the featured page, then any purchase you make that would be processed by iTunes would come off the Gift Card. You can find your Favor Point amount at the top right corner of your screen. It is denoted by the golden coin. I just tried purchasing Favor Points but I got this error message. What does it mean? Every once in a while there is an issue with payments. This can be caused by network connections, Apple account locks, or other such issues beyond our control. A general rule of thumb is if the error is in White, it is from Apple iTunes. If it is blue or transparent, it is from Underworld Empire. If you have purchased favor points but they have not downloaded yet, please give them 24 hours to do so before contacting Support. If your favor points still do not appear, please forward your iTunes receipt to support and we would be more than happy to manually credit your account. If possible, please include what error message you saw as well. Make sure to include your Army Code. I purchased Favor Points during a promotion but I didn’t get it! Favor Point Value Packs are promotional item packages that have a value of or greater than the Favor Point number shown on the advertisement. When you tap on the ad, it will bring up a list of all the items that are included. If you continue to have issues or a piece of your promotion is missing, please contact the Support Team. My friends currently are purchasing a promotion but I do not see one. Why? Most of our promotions are level locked. Meaning, while one promotion might be available to you it might not be available to your friends at the same time. Can I participate in a promotion more than once? No. Promotions are only available once for each player character. My game crashed while using a scratcher. Where is my reward? If you close out the game in the process of scratching off a scratcher, your reward will be automatically placed into your account. I can not see the Platinum Scratchers in my account. What is going wrong? Normally this is due to an outdated client. Please try updating the game. If the problem still persists, please contact Support. Sorry! 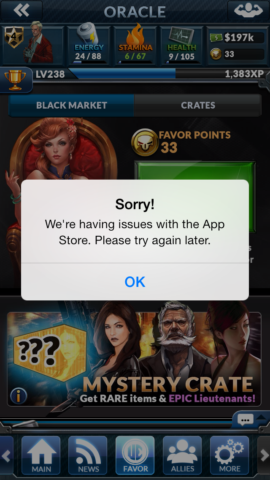 We are having issues with the App Store. Please try again later! This is a message that is sent from Apple iTunes’ Server. Please try switching from LTE to Wifi or vice versa. If that does not work, it is likely that Apple has put a hold on your account for purchasing a lot of in app purchases (can be over more than one game) and will need to be contacted to lift the hold. Best way to contact Apple Support in this case? When talking to them, just tell them about the error message and tell them you can't purchase from iTunes. If needed, ask to talk to their Apple Fraud department and have the Fraud representative to make necessary adjustments to your account in order to allow more purchases. If you were billed and did not receive favor points after waiting 30 - 40 minutes after seeing this message, you can contact us with your iTunes receipt and we would be happy to manually credit your account with the missing favor point promotion. For monetary refunds, please contact Apple Support. This issue normally comes up from Apple iTunes when there is not a good connection to wifi/LTE or if there is an issue with your account (marked for fraud or not enough funds). Try switching from LTE/3G/4G to Wifi or Vice Versa. If you were billed and did not receive favor points after waiting 30 - 40 minutes after seeing this message, you can contact us with your iTunes receipt and we would be happy to manually credit your account with the missing favor point promotion. For monetary refunds, please contact Apple Support. There is a 48 hour wait period from the time of Account Retrieval until players are able to purchase Favor Points again. This is in order to increase account security. Last edited by UWE_Tank; 03-03-2015, 11:45 PM. Why has my Underboss Seat not unlocked yet? In order to unlock the Underboss Seat, you must first have all other seats unlocked. This includes the Assassin Seat at level 100. If it continues to fail to unlock, level up one more time and it will then become available. Why can I not see the Diamond in the Tech Lab? In order to see and create the Diamond in the Tech Lab you must first make it to level 100. Why are lieutenants not showing in the fusion list while they show under my profile? Some Lieutenants are required for map/job progression. If it is the last of the lieutenant you have, you will be unable to fuse it away. This prevents players from being unable to progress. Please take another look at your experience point bar. Make sure you are using/looking at the correct class. Remember: You can not change classes during an Empire War. Being attacked and attacking is a part of the game. Double to check to make sure you are not leaving money out of the bank if you are being hit on regular occasions. Why can I not beat this player / Why can this player beat me? The PvP function is more than just what level a player is. It is how they allocated their stats, their Lieutenants (stars, levels etc) and where they are seated, as well as weapons/armor/vehicles. In order to investigate a player harassment complaint, Player Support will need proof of a Terms of Service Violation. Please submit screen shots or video along with a description of the situation. To take a screen shot, press your home and sleep button at the same time. The images can then be accessed from your gallery and included in the email correspondence with support. If you have a video, support is unable to download them either in attachment or from a website, however websites like Youtube (www.youtube.com) are not only excellent for documenting, but accessible by our office. Please submit all videos in this format. Support will then investigate further with the information you have provided and take all necessary and appropriate actions to address this matter. Due to privacy policies, they will not be able to notify you of the findings, nor of the actions necessary for the resolution of this issue. How do I obtain more Class Coins? It is compatible with iPhone 3GS, iPhone 4, iPhone 4S, iPhone 5, iPhone 5S, iPhone 5c, iPhone 6, iPhone 6 Plus, iPod touch (3rd generation), iPod touch (4th generation), iPod touch (5th generation) and iPad and iPad Air. Requires iOS 5.1 or better for full functionality. It is compatible with most Android devices (tablets and phones) including Samsungs, HTCs, etc - but may differ per your model type. Requires Android 4.3 or better. There are many reasons why applications crash. Many times it is due to memory use on your phone. If crashing continues to persist please contact Support with your crash logs and a detailed explanation of what is happening. Indeed, you can. You can turn them off in the game under “Alerts” in the More section. If you are using iOS 7, it might help to go to your Settings -> Notifications. A list of applications will appear, touch the app you wish to turn off or on notifications for. Please note that Sounds, Alerts, and Badges can all be turned on or off individually. I jailbroke/rooted my device, can you still help me? We do not support jailbroken or rooted devices. I can not see images. How do I fix this? If you are not seeing images, it is most likely due to a corrupted image file. There is an easy fix, uninstall and reinstall the game. Your account information and progression will be safe while you do so. How do I bind a character? Last edited by UWE_Tank; 07-15-2015, 11:01 PM. Reason: New information added and old or incorrect information removed.